Turtlehull Publishing has made available the latest books to be published. They are both fascinating histories; one is about a small Dallas County, Arkansas, community, the other about a young boy who became a man through his years of service in the United States Army. 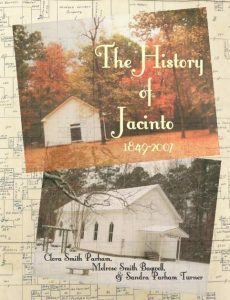 First is The History of Jacinto, a revised edition of a book compiled by my mother Clora Smith Parham and her cousin, Melrose Smith Bagwell. The updates to it include new formatting, additional photographs from the 1800’s to the 1970’s, new information and stories on various families, and the addition of one of my favorite columns of any newspaper, the “dots.” If you have read in small town newspapers the columns dedicated to the news of the various communities, then you have read a “dot.” I did research at the Dallas County Library in Fordyce and used that wonderful invention, the microfilm reader, to go through area newspapers from the 1920’s and the 1940’s. I could have sat there for days reading through those old newspapers. They were fascinating not just for the dots but for the grocery store and clothing store advertisements and front page headlines. What an excellent source of history contained on those rolls of microfilm! The original version of the book was stories and photographs copied onto sheets of paper and placed in page protectors inserted into 3-ring binder notebooks. This release will be an 8×10 paperback book, with a full-color cover and 175 pages of black and white photographs, family histories, and stories of the community of Jacinto, Arkansas. This book will be available September 9. It will retail for $20 with proceeds from the book to be divided equally between the Mt. Carmel Methodist Church Homecoming and Preservation Association and the Macedonia Baptist Church, both located in Jacinto. 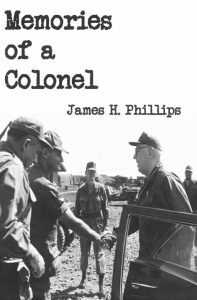 The second book is entitled Memories of a Colonel, a first-person account of a young boy born in Little Rock, Arkansas, in 1927 who would eventually become a leader of men. It is a life told with much detail, sometimes humorous, often sobering, always enthralling. There are football games, youthful exploits, gripping details of battles and the grim aftermath, friendships, love, family, travel, and making a home wherever he was in the world. This book, written over 30 years ago by the man who lived it, was set aside and forgotten about until this past spring when he and his wife rediscovered it. I have been working on it since April 1 with the transcribing it into a digital copy, researching, editing, and formatting it into a 6×9, 363-page paperback book, divided into sections illustrated with photographs of the Colonel and also of his wife and family. This book will be available November 11 on Veterans Day. The book will retail for $20 with proceeds from the book to benefit the Dallas County Museum. The release date of Memories of a Colonel is Friday, November 4, 2016. Written by James H. Phillips, a retired United States Army colonel, the original manuscript was completed in 1984 and placed in an album, where it remained until its discovery in the spring of 2016. The Colonel and his wife, Agnes, asked if I would be interested in transcribing the manuscript and editing it for publication by my then-new publishing business. Of course, I said yes, and on April 1 I began typing the first sentence, which was in the foreword: This text is dedicated to my wife, Agnes, and our three sons Jim, Ray, and Doug. By October 1, I had ordered the final edit copy, and as of right now, that book is in the Colonel’s possession as he reads over my edited version of his words. So far, he and Agnes have liked what I have done with his memoir. Agnes, I have known, or known of, for many years; her husband was someone I had heard of but never had met formally. I can remember speaking to him only once before this spring, and that was in the late 1990’s when my mother and I walked into their sunroom, where the Colonel was watching a football game while his wife entertained the Chicot Trace Chapter of the Daughters of the American Revolution in their parlor. He immediately jumped up, but we told him not to get up on our account, we were just looking to see the rooms in the beautiful home we always had admired. He was cordial, and I was a little in awe of this man who I had been told was a colonel. It was fifteen or more years before I would speak to him again. As someone who enjoys getting to know people, not just what they present superficially, but learning who they are, it has been gratifying that this door opened wide to me into the Colonel’s world. Colonel Phillips, along with his wife, Agnes, will be at the reception honoring veterans at the Dallas County Museum on Sunday, November 6, following the Veterans Day ceremony at First Baptist Church at 2:00 pm. The books will retail for $20 and will be available at the Dallas County Museum in Fordyce, Arkansas, as well as through Turtlehull Publishing. Proceeds from the sales will benefit the Dallas County Museum. What is Turtlehull Publishing up to now?